Daniel is the author of field guides to Edible Mushrooms of the Pacific Northwest and California (both Harbour Publishing, 2011 and 2012), Amazon Mushrooms (2014, co-authored) and brand a new "Field guide to Medicinal Mushrooms of North America with Robert Rogers". 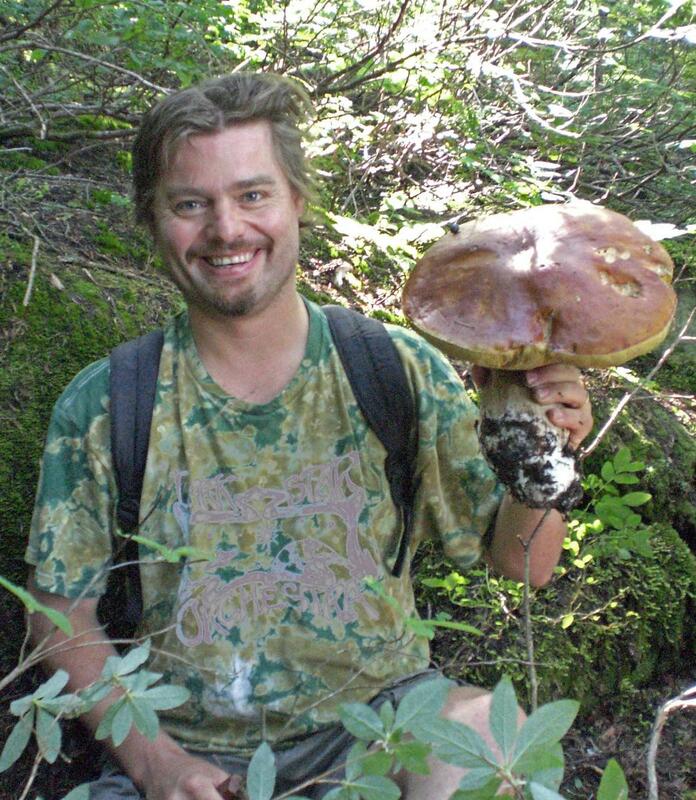 He grew up collecting and eating wild mushrooms in the Alps and has been foraging for over 20 years in the PNW and beyond, sharing his enthusiasm as a mushroom educator and guide and as PSMS vice-president. In his presentations he is combining his stunning photography with an often funny blend of entertaining stories and scientific information; he likes to refer to as "edutainment". Having been in love with mushrooms since early childhood Daniel managed to bend his career as an ecologist and geographer focused on High Asia towards researching rural Tibet's enormous fungal economy. His Cordyceps research has been featured in The Economist, National Geographic, New York Times, Washington Post, NPR, BBC World Service etc. In the last decade Daniel started exploring neotropical fungi. With his travel agency MushRoaming Daniel is organizing mushroom focused eco-adventures to Tibet, Bhutan, China, the Amazon, Colombia, the Austrian Alps and the Pacific Northwest since 2007 [www.mushroaming.com]. Daniel grew up in Munich, Bavaria, and started hunting Steinpilz (Boletus edulis) with his family at age three. In his early years Daniel was glad to supply his parents with the chanterelles, hedgehogs and boletes that they treasured so much. Finding mushrooms was just as exciting as finding Easter eggs, an excitement that is still to be had each time hunting for mushrooms. Eating wild mushrooms became a joy after discovering the rich aroma of parasols (Macrolepiota procera). Age 7 Daniel lead his first Mushroaming excursion, at least looking back it could be declared as such, since Daniel convinced parents of a school mate to join in picking Parasol mushrooms. Back at their home they were enjoyed for dinner. Later Daniel studied geography, ecology and botany in order to work on environmental issues in the Himalayas and Tibet. His main interest were the impact of unsustainable Chinese forestry practices and the impact of traditional Tibetan land-use on forest eco-systems, which resulted in large-scale deforestation. Subsequently, from the late 90s onward, Daniel consulted NGOs working in the Tibetan areas focusing on community reforestation and sustainable landuse. Daniel published many scientific papers on the Tibetan forest issues. In 1996, Daniel moved to Seattle and upon his first visit to PSMS' annual wild mushroom exhibit he joined the Puget Sound Mycological Society. Being part of PSMS enticed him to take his life-long love for mushrooms to a whole new level. Daniel trained to become a mushroom identifier for the club and teaches classes and currently serves as vice-president. Fueled by fungal bliss, Daniel seized the opportunity to direct his career in Tibet to develop an expertise in ethno-mycology, researching edible and medicinal mushrooms and their role in Tibetan culture and society. He discovered that Yartsa gunbu (Caterpillar fungus - Ophiocordyceps sinensis) is the most important source of cash income in rural Tibet. Since 2003 Daniel published over dozen articles on Yartsa gunbu. Furthermore, he researched and published the role of other economically important mushrooms such as matsutake and morels. Daniel's 2005 research cooperation resulted in increased attention towards the Yartsa gunbu phenomenon by the Tibetan administration and some policy improvements in Tibet Autonomous Region, but by far not enough is done to guarantee sustainable resource management. Daniel's research on Tibetan Cordyceps has awoken his curiosity in neotropical Cordyceps and annual trips to the Amazon have resulted in documentation of a multitude of Amazon Cordyceps species, some new to science. Daniel has collected mushrooms on four continents and in 2006 he organized his first MushRoaming tour, fungally themed eco-tours [www.MushRoaming.com]. Since then he poured his heart into growing Mushroaming and in 2015 he is organizing four tours; destinations are Tibet, Bolivian Amazon, Colombia, Austrian Alps and the "Wine & Dine Truffling Time" in Oregon. As a result of his research, local as well as international foraging, and fungal photography, Daniel presents frequently at mushroom conferences and festivals. He continues to publish his fungal stories in journals like "Fungi Magazine", "Mushroom - The Journal", and the German mushroom fanzine "Der Tintling". His Cordyceps research has been featured in The Economist, National Geographic, New York Times, Washington Post, NPR, BBC World Service etc. Furthermore, he keeps uploading photos and stories on his extensive webpages and blogs at www.Mushroaming.com. In 2011 Daniel published "A field guide to Edible Mushrooms of the Pacific Northwest" and in 2012 "A field guide to Edible Mushrooms of California" (both Harbour Publishing). In 2014 Daniel co-authored with Larry Evans "A Field Guide to Tropical Amazon Mushrooms", the first field guide for this amazing biodiverse region; In 2018 he published with Robert Rogers "A Field Guide to Medicinal Mushrooms of North America". Daniel keeps venturing out into new and old habitats and cultures to feed his curiosity and his family, along the way capturing images and gathering stories to share in his writings and presentations. where he has been researching and consulting for over twenty years. for many years and has published many scientific papers.